You've tried the rest now try the best - 4/5th March 2017 EMCC Nottingham 8th Year. 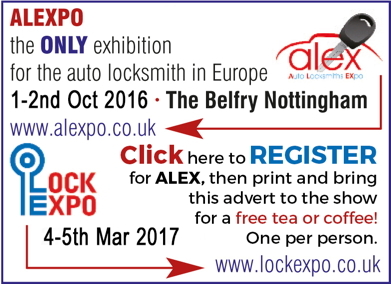 And don't forget ALEXPO 1/2nd Oct alexpo.co.uk for auto locksmiths. Hickleys has attained national dominance is in the field of vehicle keys and key programming. The company has assembled a 'complete, comprehensive package' for all involved in the business of key programming. This package includes the best products on the market relating to programming, cloning, key cutting, pin code extraction and eprom reading. A full range of keys, remotes and transponders is also available. In addition, a new 'Automotive Training Academy' has been established and the company is proud to say that many of the auto-locksmiths operating throughout the UK have been trained by Hickleys and are using equipment supplied by the company. Come and see the latest equipment, talk to experts and buy at show prices. China is Britain's biggest supplier of surveillance equipment in revelations that have led to security experts questioning the oversight of Beijing's investment in the country. The Chinese government controls Hikvision which has sold more than one million closed-circuit television cameras and recorders to UK clients which have been used in airports, stadiums and the London Tube. SSAIB.org will be posting full details of all the dates, locations and venues, with this autumn's events already confirmed as taking place in Plymouth on 11th October, Swindon on 12th October and Cardiff on 13th October. Tradelocks offer a range of auto courses at their very own Genuine Lishi Training Academy which is located at their premises in Whitefield, Greater Manchester. The courses span from just 1 day to over a week and you'll be shown full hospitality by Tradelocks with a buffet lunch and refreshments all day. Since the Brexit result in June, from governments down there is international uncertainty concerning the UK's future trading position. Uncertainty brings speculation, resulting in the dramatic decline of the value of the £ against both the € and the $. The £'s decline has already forced many UK suppliers and manufacturers dependent on goods supplied from Europe or China to increase their prices, often with a double digit percentage. Neither the UK hardware and security market in general nor ABUS in particular are immune from these issues. ABUS UK is reliant on supply of quality products supplied in €s from Germany, and in $s from our factories in China. The multi-national PLC which was previously based in Walsall, West Midlands, has now moved to brand new, modern premises in the second city, Birmingham. The relocation has been in response to its rapid growth through numerous acquisitions within the last two years.